A trip to the dentist can often be intimidating for many people. Due to this anxiety, they may not receive necessary dental care, causing their oral health to suffer as a result. To help patients feel more comfortable during their visit, Dr. Ann Haggard is pleased to offer the option of sedation dentistry. This stress-relief technique can be utilized during routine care, as well as procedures like porcelain veneers or gum disease treatment for a more pleasant experience. Our dentists encourage anyone who dreads visiting the dentist to consider the potential of sedation to help them relax or sleep comfortably while they get the care they need. To learn more about our sedation dentistry techniques, please explore the informational sections provided below or feel free to contact us with any questions you may have. IV sedation is a method of putting a patient into a state of sedation (sleep) with a medication that is administered intravenously. Patients undergoing IV sedation do not experience the sights or sounds of their dental work. They are asleep and have no memory of the visit once the IV medication starts working. With IV sedation, the medication goes directly into the bloodstream, and Dr. Ann is able to closely monitor its effects on a minute-by-minute basis. She adjusts the dosage of medication for your specific response. When the dental work is completed, the administration of the IV medication is stopped, but it does have a lingering effect. At this point, you go home with your pre-designated driver to sleep off the remainder of the medication. What IV Sedation is Not! IV sedation is not the same thing as general anesthesia in a hospital setting. IV sedation does not require any intubation or breathing machines. Your body is still fully able to perform its normal functions for life. Many people mistakenly assume that taking an oral medication (pill) for sedation is safer than intravenous medication. The opposite is actually true. With IV sedation, your doctor is able to control exactly how much of the sedative medication goes into your bloodstream. Because oral medications have to pass through your GI tract, different bodies absorb the medication at different rates. IV sedation is more predictable and controllable than oral sedation. Anyone whose fear of the dentist is keeping them from taking care of needed dental work! Another good candidate for IV sedation is someone who needs a large amount of dental work and would like to have it completed in one full-day appointment. The most common example of a patient for IV sedation is a person in his or her late teens needing extraction of all four wisdom teeth. Who Cannot Have IV Sedation? There are only a few conditions that would make someone ineligible for IV sedation. Patients with severe medical problems are not good candidates for IV sedation. Their dental work is best accomplished in a hospital with medical supervision. Certain lung conditions and breathing problems can lead to complications with IV sedation, so these patients are not good candidates. It is essential that you discuss your medical history in great detail with Dr. Ann. She needs all of the information to keep you safe. How Can I Get Dental Work with IV Sedation? The first step is to call our office and make an appointment! Your first visit will be a comprehensive evaluation. This means we will do a thorough, detailed examination of your mouth, teeth, gums, and jaws. We will also take some x-rays to get a complete look at things going on behind the scenes. At this visit, we are just gathering information, NOT doing dental work. 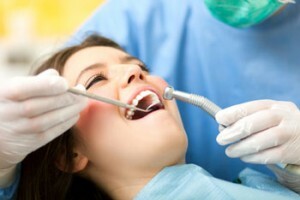 You should not experience any pain while we evaluate your teeth and take the x-rays. If you do, please let us know. Sometimes a toothache is so severe that even the slightest touch causes discomfort. We understand that and will make every effort to keep you out of pain. After Dr. Ann and Dr. Lauren determine your exact dental problems, they will discuss your treatment options with you. They can help you decide which dental work will best meet your specific needs. Then your appointment for the dental work with IV sedation is scheduled! Call our office today to schedule a consultation with Dr. Ann and Dr. Lauren. Explain that you’d like to have IV sedation for your dental work. Then everyone will be on the same page from the moment you walk in the door. At Designer Smiles, we offer oral conscious sedation, which means you can look forward to a virtually pain-free dental visit without being completely unconscious. Unlike IV sedation, there is no anesthetic involved, and you will simply be given medication prior to your treatment. By the time your treatment begins, you should feel deeply relaxed and should not notice sensations of discomfort or pressure. Throughout the entire procedure, you can communicate with our team, though you may not remember any details about the procedure by the time the sedative has worn off. The effects of oral conscious sedation can take several hours to subside. As a result, we require you to arrange for someone to take you to and from your procedure, since you will be too drowsy to operate a vehicle. If you have sensitive teeth and gums, feel uncomfortable when hearing the sound of dental tools, or simply get anxious about going to the dentist, sedation dentistry may be beneficial for you. For more information about sedation dentistry techniques, please contact us today.